Video clip synopsis – Neville Bonner grew up on the banks of the Richmond River and started his working life as a ringbarker, canecutter and stockman. He spent 16 years on the repressive Palm Island Aboriginal Reserve where he learned many of the skills that would help him later as a politician. Broadband MP4 bonnbeg_bb.mp4 (4.4MB), suitable for iPods and computer downloads. 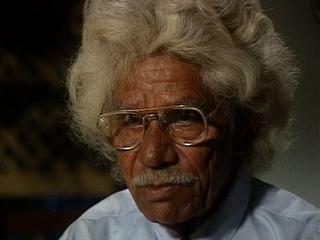 Neville Bonner – Beginnings is an excerpt from the program Neville Bonner (26 mins), an episode of Australian Biography Series 1 (7×26 mins), produced in 1991. Neville Bonner’s mother was an Aboriginal, and he never knew his father, an Englishman who went back to England before Bonner was born. “I was born on Ukerebagh Island, in the mouth of the Tweed River because there was nowhere else for my mother to go. In those days… Aboriginal people had to be out of the towns before sunset.” Prevented from attending the town’s hospital until sunrise the following day, his mother gave birth in a gunya* under a palm tree. When Bonner was about five, the family left the island to live with his grandparents in a camp on the banks of the Richmond River. When his mother died, he and his brother lived with their grandparents. When his grandmother died he packed his swag and set off to find work. He married in 1943, and in 1946 took his family to Palm Island, off the Queensland coast. Palm Island was established as a mission for Indigenous people in 1918 to replace the Hull River Mission, which had been destroyed by a cyclone. Over the next two decades, 1,630 Aboriginal and Torres Strait Islanders from all over Australia were sent there. Missions such as Palm Island existed across Australia and were an important part of government policy towards Indigenous people at the time. Describe what happened to Neville Bonner’s mother when she was young. Ask whether she could have been cured or whether it is fair to suggest that her condition later in life was due to neglect of Aboriginal people in general. Describe and comment on the conditions in which Neville Bonner and his family lived when he was very young, during the 1920s and into the 1930s. Offer reasons for why Neville’s family lived in such a pitiable state, as described in the video. Imagine you are a journalist from a capital city, visiting a rural district in your state or territory, and witnessing scenes similar to what Neville describes in the video. Write a report or an editorial for your newspaper about your observations. Use a headline and, if you include one or more photographs, use captions. Desktop publish your report to make it look like a published newspaper item. Remember that in this activity you are likely to be drawing on specific observations to offer generalised opinions, assumptions and arguments. In pairs research the life of Neville Bonner then create a poster display of his achievements and of the obstacles he overcame. Are Indigenous Australians today living in rural conditions the same as those described in the video, or have there been changes over the decades? Should Australians generally be satisfied that Indigenous people in rural districts have adequate and suitable housing accommodation? In groups research these questions and present a written report, with suggestions and recommendations if necessary, in 400–500 words. You may wish to confine your report to your own state or territory.